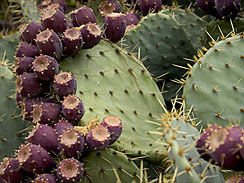 Prickly pear cactus is a wild edible that’s also cultivated here in Southern Cali. You can find it growing in the hills wild, and scattered throughout neighborhoods, especially alongside fencing. In certain parts of the southwest it grows so prolifically ranchers consider it a nuisance plant. The pads are shaped like beaver tails, covered with long thin needle-like spikes. The plant generally grows knee or waste height, though patches can easily reach five feet tall. The fruit is oval shaped, about the size and shape of a small-ish plum. Colored dark red or burgundy on the outside, it’s brilliant magenta orange on the inside. Fruits lack the pads’ long spines, but do have little short bristly spines of their own. Both the pads and fruit are edible without destroying the plant. You can gently pull the fruit off. Pads can be removed pretty easily at the joint, with just a little bending and pulling, but watch out for those spines! Bring sturdy work gloves. The sweet fruit is great pick-me-up trail food, or can be processed into jellies, chilled beverages, slushies, syrups, liqueur or used in fruit salads. The seeds are edible, though some folks remove them. 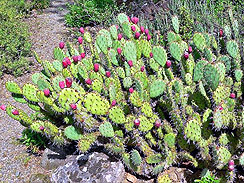 The pads, sold in grocery stores by the name nopales, can also be eaten raw or cooked. You can remove the spines by scraping with a knife or burning them off during cooking with fire. Use it raw cubed in salads, sautéed, breaded and fried, boiled, tossed in soup, and I’ve seen it pickled. The pads are high in iron, beta carotene, vitamin C, and calcium. The deep red color of the fruit suggest anti-oxidant properties. 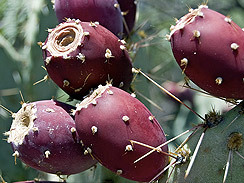 By the way, ALL cactus fruits are edible, though not all are tasty. Some are bland and more full of seeds than fruit flesh. But several species growing around LA are tasty and sweet. While wearing rubber gloves, wash fruit, then cut in half lengthwise. Still wearing your gloves, scoop fruit along with seeds out from skin. The point here is to discard all of the skin along with its small stinging bristles. Cut into cubes and toss into blender with water and ice. Smash everything on high until the ice cubes have been pulverized into little chips. Pour into glass and enjoy. Garnish with mint.